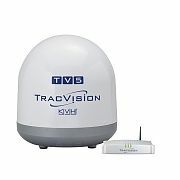 With 30% greater reception than other 45 cm (18-inch) systems, you’ll enjoy satellite TV reception where few others can provide it. TracVision TV5 offers outstanding high performance tracking and reception, as well as compatibility with DIRECTV U.S., DIRECTV Latin America, DISH Network, Bell TV, and circular and linear Ku-band services worldwide. This rugged system is ideal for sportfishing boats or boats venturing offshore or to the islands.